The first week of my two month paid holiday (so sorry for all you non-teachers out there) has gone by. I spent most of it catching up on work for my COETAIL course that was supposed to be finished on June 6th! Woops! Anyway, I am almost finished so I decided to do something touristy this week. Now my other focus lately has been battling my massive weight gain since I got back from Ghana. I had a look around for a tape worm but Japan seems to be out of them. Hence, I am back with Weight Watchers. This means I am eating a lot of fruit and vegetables at the moment and that is fine when they come with a coconut curry sauce and a huge serving of white rice. Not so fine when they are raw in a bowl with a teaspoon of soy sauce and a quarter of a lemon squirted on them. Now the great thing about Weight Watchers, is that the more I exercise, the more I can eat, so I decided to kill two birds with one stone. I wanted to go somewhere with tourist value and when I arrived, I wanted to eat Thai green prawn curry and drink a couple of glasses of a crisp, fruity white wine and not feel guilty. 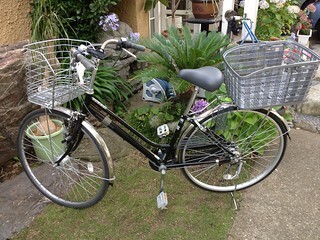 So, I decided to ride my bike to Kamakura. Kamakura is a small fishing village 25 km south of Yokers. It was once a feudal capital and because of this, there are lots of pretty temples and a big Buddah. I had taken mum to see the big Buddah when she was here and I’m not that keen on seeing more temples but I fancied going to the beach, enjoying a lovely bike ride through the countryside and having a delicious dinner with one of my colleagues who lives there. Now I didn’t just rush into this idea. I first came up with the thought after speaking to another colleague who has ridden his bike to Kamakura on a number of occasions. He said it takes about an hour and fifteen minutes and it is fairly flat so it isn’t too taxing. Sounds perfect right? Just to let you know, I’m currently writing this after arriving in Kamakura. And in hindsight, I probably should have taken his advice with a grain of salt. He is a PE teacher and therefore one can probably assume, quite a lot fitter than me. He also has one of those fancy road bikes with 125 gears to make cycling up hills a breeze. The only special feature on my bike is an extendable back basket so I can pick up a 12 pack of toilet paper when I do my grocery shopping. I’m not completely stupid, so I knew it would take me longer than him but I estimated that it would take no more than two hours. I left at 9am. I arrived three hours later at the Starbucks outside of Kamakura Station. Fairly flat? My arse! I also fell off once and that’s not easy when you’re sober! As for the pretty ride in the countryside, I never saw the end of Yokahama. It was built up all the way until I finally reached Kita-kamakura station which began the 1.5 km of partial green before reaching the town centre. The journey didn’t start off well either. I ensured that my phone was fully charged as I needed to rely on my Google Map app for directions. My bike does have one snazzy feature I forgot to mention and that is an iPhone holder on the handle bars. I got that about three weeks into living here after falling off and cleaning up a bunch of pedestrians whilst holding my phone in one hand and trying to navigate at speed through some very busy and very narrow streets in Yokers. The pedestrians were very polite about it but I could tell they weren’t happy! Anyway, Google Maps has a couple of design problems. First of all, you only have three options for mode of travel; public transport, car or walking. No bike option. This means, if you take the car option, the route always involves the express way which I can’t ride on and the walking option always involves stairs for some reason. I can work around the stair problem but I had only been going about 20 minutes when I came across the second design problem. Yes, that’s right. 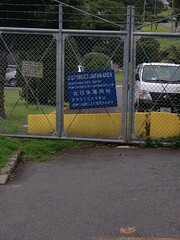 The road continues through the US base. Google wants me to continue along this road, however the US military does not. Google loses this contest. I try to cycle around a bit and then get the map to recalculate the route from my new location. I follow the new route for a while until I run into yet another sign. Turns out the base is like Switzerland – too large to cycle around but there is no way to cycle through it either! Getting around the US base, added on an extra hour to my cycle easy. The way home proved just as fraught with the same obstacles as the way down. Google kept sending me up huge staircases just like this. Come on Google – get the bike option! One staircase got suspiciously overgrown from underuse as I carried my bike further up it, until the path eventually disappeared altogether as it ended in … you guessed it… the same US base I couldn’t avoid on the way down! This is the path according to google maps! 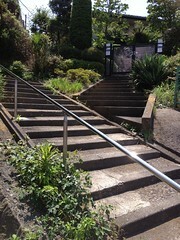 However, the time I spent in Kamakura was all good and this was despite not achieving any of my original objectives. I didn’t go swimming – forgot to pack my bathers and disastrously, my deodorant. I didn’t have a Thai green prawn curry as the Thai restaurant wasn’t open. I didn’t have a crisp, fruity glass of wine either as my dinner companion was having a “dry summer”. (Apparently he only drinks when he’s working!) I did however, enjoy a pleasant afternoon and evening in Kamakura and a very delicious dinner all the same and I didn’t count a single Weight Watchers point for two glorious days! So for those people who insist that it is all about the journey and not the destination, I have one word for you – bullocks! Think you should change your Iphone for an android, or just move countries!! I do have a bike function on google maps..and it is my best friend here 🙂 Maybe in Japan you are not suppose to bike! Anyhow great blog. Seriously? I’m spewing! Nobody has an android in Japan – it is all about the iPhone here. Can’t believe you have the bike option. I’m checking the app store! Me too. I’m going home on Monday so hopefully I won’t get lost, fall over or find myself having to navigate around large obstacles on the way to the airport! Reading your story Mel, I felt like I was sweating it out beside you. The Tour de France is coming through Luchon this weekend and I was thinking of getting into the spirit and riding a bike for some extra activity. You’ve just reminded me of why I prefer to walk or drive. good blog and good story though! Good read! Trust me Jazz, I’ve done the research re journey v destination! You are right about the local map though. Can’t balance the bas#%@d on my handlebars though! 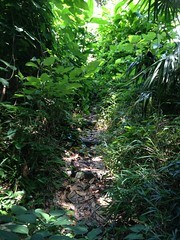 It was great to see you in Kamkura and now that you know the way….. The Thai restaurants are due to open tomorrow, though the wind may delay that a few days. By the way, when you say ‘he only drinks when he is working’, that doesn’t mean during classes! – you look so pretty in your African- dress! – i reconise some Pictures from Japan, I went to the same places! Nice! Keep going with your Website, you made a good Job. Thanks Sven. I’ll be posting my next story soon about my skiing trip in New Zealand so keep posted!